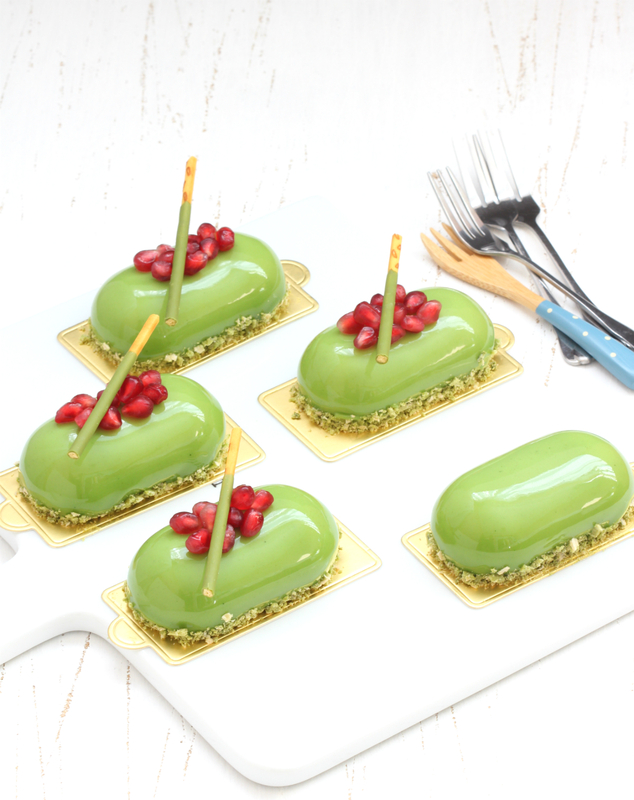 my bare cupboard: Matcha-pomegranate mini entremet "
These mini gâteaux may look a bit daunting or complicated but most components can be made in advance . The lists below are not an actual entremet recipe , I just combined 3 recipes from 3 books and came up with these pretty mini gateaux . Making these layer cakes is easy but a bit time-consuming especially if you use small silicon moulds ( scroll down for photo ) . Flavour-wise , the sweet-tart flavour of pomegranate jelly pairs perfectly well with matcha mousse . The amount of pom jelly ( forgot to take photo ) and the joconde is more than enough for 8 cakes , I only used half of both . 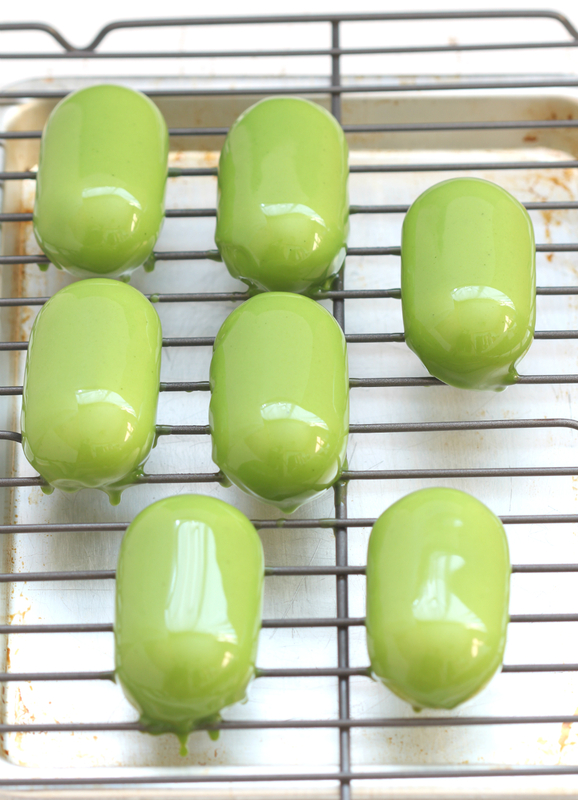 For the matcha mirror glaze , you can make 1/2 of the recipe , leftover should be kept in an airtight container and refrigerated ; use within 4 days . There's no condensed milk added in the glaze so sweetness is just right and doesn't overwhelm other flavours but rather complimented it perfectly . And the shiny glaze certainly looks very pleasing , isn't it ? * Preheat oven to 200ºC . Line a 9 x 13-inch rimmed baking sheet with silpat or parchment paper . * Beat egg white until frothy , add in caster sugar and whisk until stiff peaks form , set aside until needed . * Combine icing sugar , ground almonds and flour . Add the whole egg and beat together until mixture is light and fluffy . * Melt butter ( make sure it's not too warm ) and slowly add it to the egg mixture , beating well until butter is fully incorporated . * Fold meringue gently into the egg mixture them spread evenly into the prepared pan . Bake in the preheated oven for 10-12 minutes or until golden brown and the sponge springs back when pressed gently . Let cool completely before using . 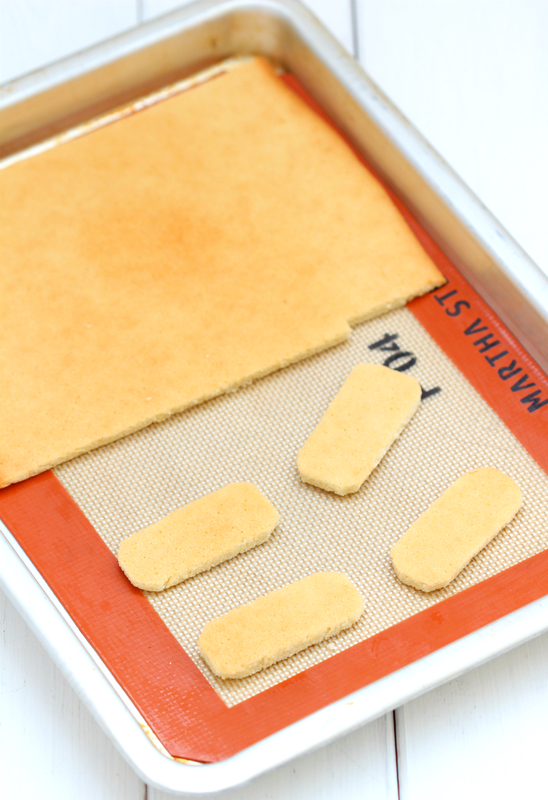 * Cut out 8 pieces ( 2 1/2 x 1 1/4-inch ) sponge , chill in the fridge until needed . * Soak gelatin sheets in cold water for 10 minutes . * Place white chocolate in a small mixing bowl . * Beat whipping cream until stiff peaks form , do not over beat . Chill in the fridge until needed . * In a small saucepan , bring milk and green tea to a boil . * Whisk yolks and sugar until light and fluffy . 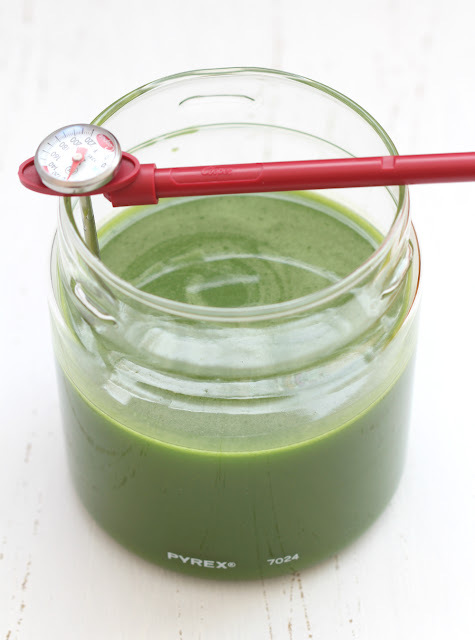 Gradually pour in the warm green tea milk to the yolk mixture , whisking as you pour to prevent yolks from curdling . Pour back mixture into the pan , cook over low heat until thickens ( custard temperature should be 176ºF ; mine thickens rapidly and only reached 150ºF due to the reduced amount of milk ) . Immediately pour into the white chocolate , whisk until chocolate is melted . * Combine drinking water and softened gelatin ( squeeze off excess water ) in a small heat-proof bowl . Place bowl in a pan of barely simmering water , stir until gelatin is completely melted . 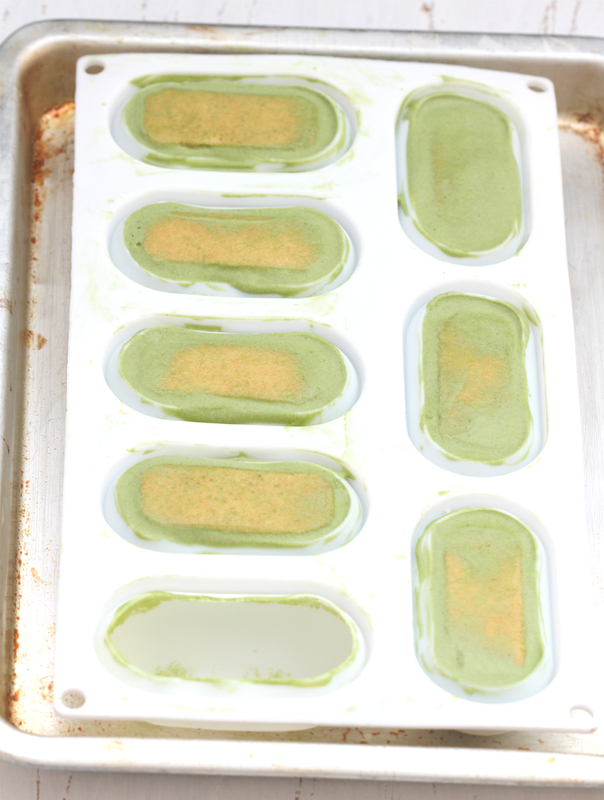 Pour melted gelatin immediately into the green tea-chocolate mixture and mix thoroughly . Strain mixture through a sieve . * Fold whipped cream into the green tea custard . * Combine ingredients above in a heat-proof bowl . Place bowl into a pan with barely simmering water , stir until gelatine is completely melted . Pour mixture into a 7 or 8 inch-pan square , chill in the fridge until set . You can make this a day ahead . * Slice 8 pieces of jelly , the same size as the joconde . * Place matcha mousse in a plastic piping bag . Pipe some mousse ( just guesstimate the amount ) into the base of the mould , top with pom jelly . Pipe some more mousse on top and around the jelly , leaving a small space to place the joconde biscuit . Smooth top using an offset spatula , adding more mousse if necessary . Continue with the rest . * Freeze until set , at least 4 hours , preferably overnight . 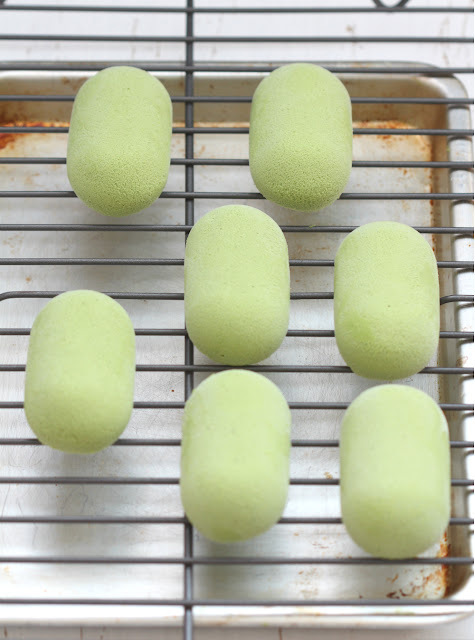 * Unmould each mousse , place on the top of the wire rack and put it back to the freezer for 30 minutes before pouring in the glaze . * Soak gelatine for 10 minutes or until softens . Squeeze off excess water . * Combine water , sugar and glucose in a saucepan , bring to the boil and heat to 103ºC / 218ºF . * Add in the matcha paste , cream and softened gelatine , stir to combine . Pour mixture into white chocolate , whisk until smooth or use a hand-held electric stick blender . Strain glaze , place plastic wrap on top of the glaze to prevent skin from forming . * Make the glaze a day ahead or several hours before using . Gently re-heat glaze and use a hand-held blender to smooth out lumps . * Let glaze cool to 30ºC / 86ºF before using . * Take out the mousse from the freezer , immediately pour the glaze on each piece , pouring glaze twice or 3 times , according to preference . Chill in the fridge for 10 minutes , remove the entremets from the wire rack and place on a serving plate or individual paper cake holder . Leave entremets to de-frost in fridge for at least 2 hours before serving . 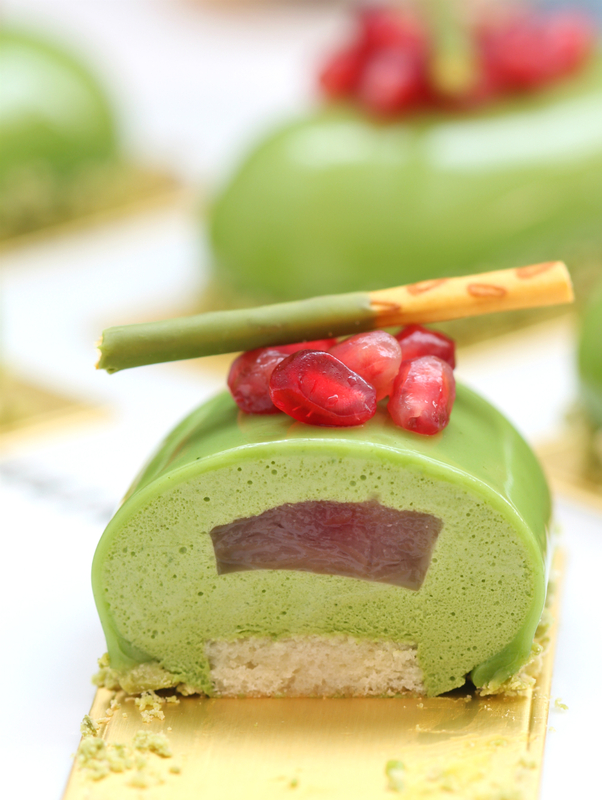 * When ready to serve , decorate the lower edges / sides with crushed matcha Kitkat , top with pomegranate seeds and matcha Pocky . Hi , can i know the cake can last how long in room temp? You make desserts like a pro, Anne. 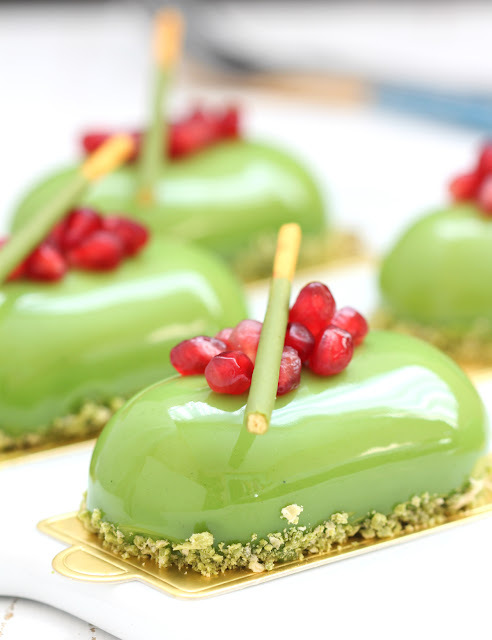 These look really gorgeous with that mirror glaze. Hi Ann, I am so happy to have found your blog when I am researching on entremets. Love all the posts that you share about entremets. You make them so easy to follow. Appreciate your generous sharing. Thank you very much. 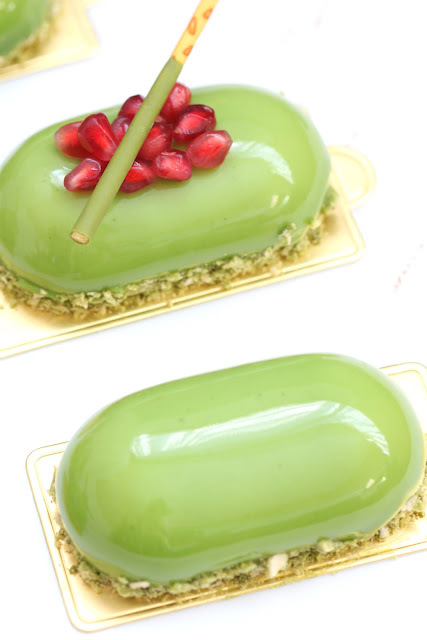 Going to attempt making one entremet tonight based on your mango pomelo and matcha petit but using the mirror glaze recipe here.